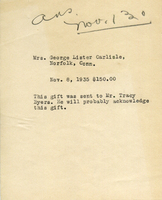 Mrs. Jno D McIlhenny contributed $150. 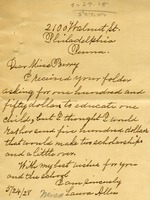 A general letter sent out asking for donations for scholarship funds to send children to Berry. Miss Laura Allen says that she saw Martha Berry's request that donors give $150 to educate one child. Miss Allen responds to this request by sending $500 for two scholarships. This seems to be an advertisement asking for donations of $150 dollars to the Berry Schools. 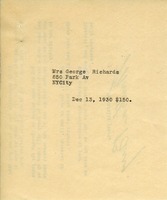 A letter to Martha Berry from Helen A. Jaeger, concerning Mrs. Jaeger's last installment of $35.00 for her pledge of $150.00 to the school.